Consumers are becoming more conscious of where they spend their money, especially when it comes to e-commerce. From fair-trade logos to plastic-free packaging, eyewear brands are listening and adapting their supply chain. If you want to keep up with consumer trends, you'll need to offer eco-conscious eyecare products in your optical dispensary. You can also inform your patients on the benefits of living or purchasing sustainably with your product descriptions. We've scoured the internet for vetted brands making frames, solution, and eye accessories through recycled materials, fair labor, and other ethically-focused methods. Keep reading to see what we've found. Optometry office managers and ODs alike can look for suppliers that uphold sustainable values, pay fair wages, and focus on using fewer resources in general. For patients who are fully committed to reducing their carbon footprint, you can source local suppliers and emphasize the fact that buying from a local optometry practice is the first step to sustainable eyecare. The fact that your inventory didn't have to be shipped to the consumer via plane or a long truck journey means less fuels were needed to deliver them. If you aren't sure whether your patients will respond well to these products, send out a survey through your email automation platform or simply have a poll posted in your practice. You might be surprised by the demand for environmentally friendly products in your patient base. If you're interested in seeing what natural products are available for your dispensary, these are only a few examples. As the industry grows, so will your options for dispensary inventory. There are a few brands showing commitment to reducing their carbon footprint as well as satisfying their consumers. MODO, a popular frames designer you might already carry, has a collection made from recycled materials and plants a tree for every frame they sell. With recent eyewear trends looking to the past, you can find vintage frames online or locally. Although you may not be able to stock these frames 24/7, you can invite these resellers to showcase their products in your dispensary once a month and create an eco-friendly marketing campaign for the days they're in stock. Eco-friendly sunglasses are easier to find. The Good Trade has done the research and found 9 sustainably made sunglasses that will pass the durability test. Another example of a sunglasses brands that reduces waste is Costa with their "kick plastic" campaign to raise awareness of the plastic waste that pollutes the ocean. Zeal Optics also creates their sunglasses, polarized and prescription options available, from plant-based resources so that they're sustainable and recyclable. Sustainability goes hand-in-hand with charity, too. Most of these brands also have a program set up to give back to local and global communities. With some patients disposing of their contact lenses in the drain or toilet, lenses are turning into micro-plastics in the oceans and harming fish. Overall, contact lenses by nature cannot be as eco-friendly as eyeglasses because they must be made with non-biodegradable plastic. However, that shouldn't stop contact lens companies from thinking about their manufacturing and packaging processes. The most eco-friendly way to manufacture lenses is to make them in-house from reused equipment you could buy here. However, we know this might not be an option for all small optical retailers. Essilor's first lens to go-green, Airwear's production waste is recycled so that it can be used in manufacturing other products. All the water used to make the lenses is recycled water as well. All their packaging is 100% recycled and their ReNu lens solution bottles are recyclable. All ACUVUE containers are now made with 30% recycled cardboard instead of plastic and their contact lenses use less packaging than other brands overall. For animal rights activists and patients who only purchase cruelty-free products, Clear Conscience stocks eye drops and lens solution that aren't tested on animals. There are a few other ways to raise awareness for eye product waste in your practice. Educate your patients on the most eco-friendly way to dispose of contact lenses so that the plastic doesn't end up in the ocean. Also, you can start a recycling program for used frames that have no further use to your patients. 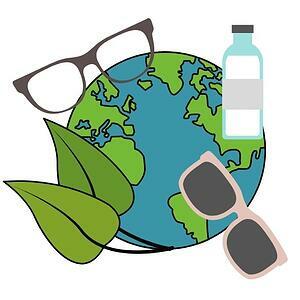 We hope that you've been inspired to stock up on eco-friendly products and promote sustainable eyecare to your patients. If you want more methods to keep up with eye trends, subscribe to VisionWeb's blog and receive notifications when we post.